Dennis Wrigley, Maranatha Co-Founder and Leader, addresses the community and the nation at this time of crisis in the following video, which can also be seen on our Latest Media page. This entry was posted in 03 Witnessing on August 10, 2011 by Maranatha Community. WE STRONGLY BELIEVE THE UNITED PRAYER OF GOD’S PEOPLE WILL HAVE AN IMMEDIATE AND POWERFUL INFLUENCE UPON THE STATE OF OUR NATION TODAY. It is urgent that, as Christians, we take our positions as members of the Body of Christ and PRAY earnestly for the United Kingdom. The current riots across the land hold up a mirror to the moral and spiritual sickness of our nation. The issues facing us today are not primarily political or social but spiritual. This is yet another manifestation of the consequences of our nation turning its back on God and His ways. It follows the exposure of corruption in the banking system, the Parliamentary expenses scandal, the phone hacking inquiry and corruption in the police. We believe that God, in His mercy, is shining the light of His Truth on to the ugly wound of our nation which is in need of cleansing and healing. The riots are the fruit of our betrayal of our younger generations whom we have robbed of hope and purpose. The police, politicians and others in positions of worldly authority are desperately searching for ways to bring the rioters under control. In this situation it is the mandate of the people of God to exercise spiritual authority through united prayer. For those in positions of authority – MP’s, Local councils, Police, Community leaders – to be given wisdom and Godly advice. For church leaders to speak with one voice, identifying clearly the spiritual nature of what is happening. For confusion of spiritual communication between demonic forces and a collapse of mob formation. For protection of people, their lives and their property in areas of rioting, and protection of police and those enforcing law and order. For cleansing and healing of the underlying causes of our national sickness. This entry was posted in 01 Praying, 03 Witnessing on August 10, 2011 by Maranatha Community. 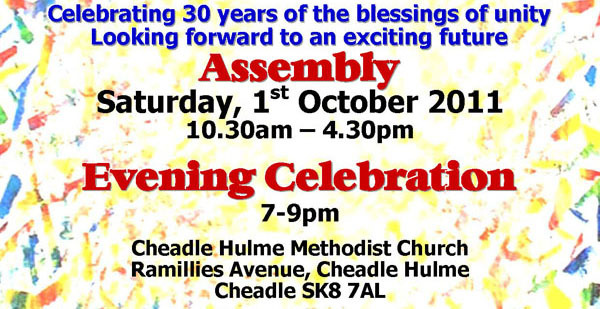 Ablaze for His Glory – All are invited – to celebrate 30 years of the blessings of unity. The Maranatha Community is an open, free and loving community of Christians from all denominations of the Church – Anglicans, Roman Catholics, Baptists, Methodists, Salvationist, Pentecostalists, Orthodox, Presbyterians, members of the United Reformed, non-denominational, new and independent churches. As a Community we are committed to praying and working for the unity, renewal and healing of the Church and of the Nations. Maranatha is a prayer – “Come Lord Jesus!” We pray that He will come now and we look forward to His final coming in glory. At this celebratory gathering we will give glory to God for all the ways that He has revealed Himself to His people and for all that He has done in and through this Community over the last 30 years. We also look forward to all that He is calling us to be and do for His further glory. Accommodation is available locally. 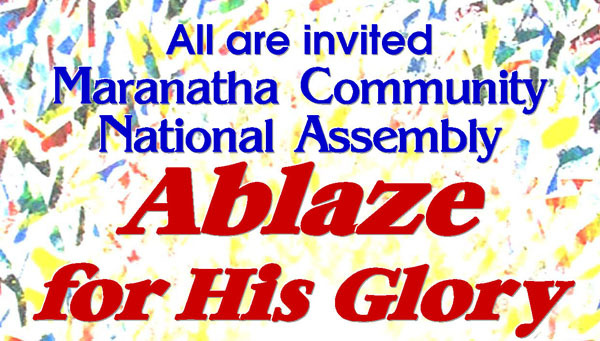 Contact the Maranatha office for information. Refreshments – Drinks will be provided – please bring sandwiches for lunch. There are local restaurants and takeaways available for those wishing to have an evening meal before the Evening Celebration. Children are welcome with their parents, but we regret that there are no supervised children or crèche facilities available. Click here for leaflet including maps and directions. This entry was posted in 06 Living on August 5, 2011 by Maranatha Community.